I have to admit I wasn’t ready for my dad to die. No one ever does. No one is ready for their parents to die. I wasn’t ready to plan a funeral. I wasn’t ready to pick out clothes for him to wear. I wasn’t ready to deal with all his belongings that had to be moved out of his apartment as soon as possible because “they needed his apartment for another.” It was just business for them. But not for me. Today is the one year anniversary of the death of my mother. She was 79 years old when she passed away. Her death was not unexpected. Cancer is terrible and no one deserves the pain she endured. Through all the agony, you are not the same person you once were. You change. Here are 11 ways losing a parent changes you. 1. There is a sense of relief after a suffering parent dies. My mom suffered greatly during the past few years of her life. Cancer did that to her. Even though it wasn’t confirmed until a week before her death that her cancer was back, we had suspicions. Even so, hope is always present. Always. Hanging on to any little smidgen of hope until there is none. 2. You become angry. You want the last word. 3. You realize that family is more important than ever. Even the darkest night will end and the sun will rise . . . There are things in life that are just so unfair. Events like the tragic death of a young man. Our small rural community was hit with a tragedy a couple of weeks ago that no family should ever have to live through. A deadly car accident took the life of a 34-year-old son, husband and father. Even though I did not know this man personally, my daughter and son-in-law were good friends with him and I know his wife and her family. 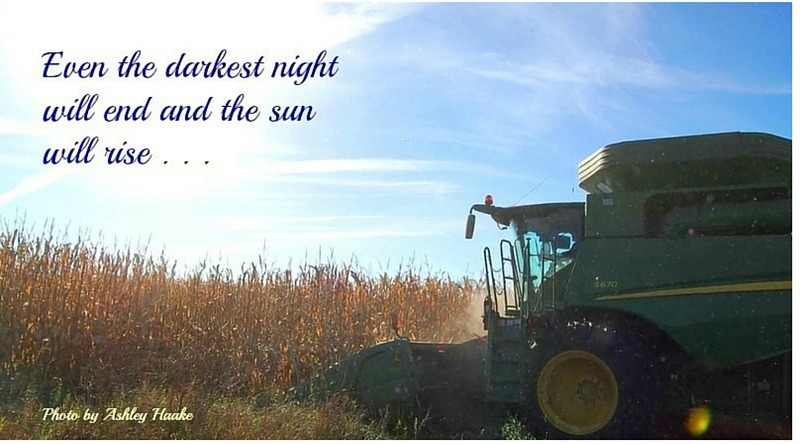 When I received the dreadful news, I was in the combine harvesting corn in a nearby field. In complete shock and disbelief, all I could do was pray through my tears. Not only was his family grieving . . .
but we were ALL grieving. And we hurt. Let me tell you a bit about this young man. He loved the farm! It was harvest season and his corn was ready to harvest. And he was so excited about harvesting his first crop! But that dream abruptly came to an end. (But) Even the darkest night will end and the sun will rise . . .
And the “sun that will rise” is our farming community. When tragedies strike, farming communities step up to the plate and help. They are not asked, they just show up ready to get their hands dirty. It’s who we are. Period. Our family also had the opportunity to see firsthand how neighbors and friends help each other. A number of years ago, during harvest season, my father-in-law suffered a heart attack and went through bypass surgery. At the time, there was no way we could finish harvest ourselves. We never asked for help. It just arrived. Combines showed up and helped us finish the harvest. It literally takes your breath away when you see the generosity of others. The Lord is good. Sometimes I complain that I have to travel an hour to the closest Target store or Best Buy store. But I would not trade the convenience with the values and morals we live and see every single day here in our small rural community. Life is about what is important. And we are important to each other. And sometimes I become frustrated when outsiders like to categorize us as “Big Ag” or “factory farms.” No. We are people. We are families. We are friends. We are neighbors. Helping each other. Hugging and crying together. Praying together. That’s who we are . . . Please take time and watch this video. 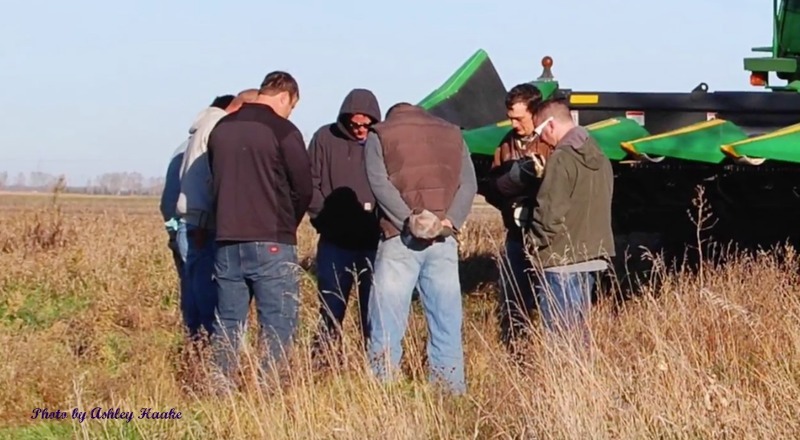 His family put this video together showing pictures of friends and neighbors coming together as they helped harvest his corn field. Be sure to have a tissue nearby. His wife and daughter are also in the video. As I was sitting in my combine seat this past Saturday afternoon thinking about how nice the corn looked as I was harvesting, I noticed to my north and east smoke. I honestly didn’t think too much of it—thinking someone was burning their CRP land or burning a road ditch. 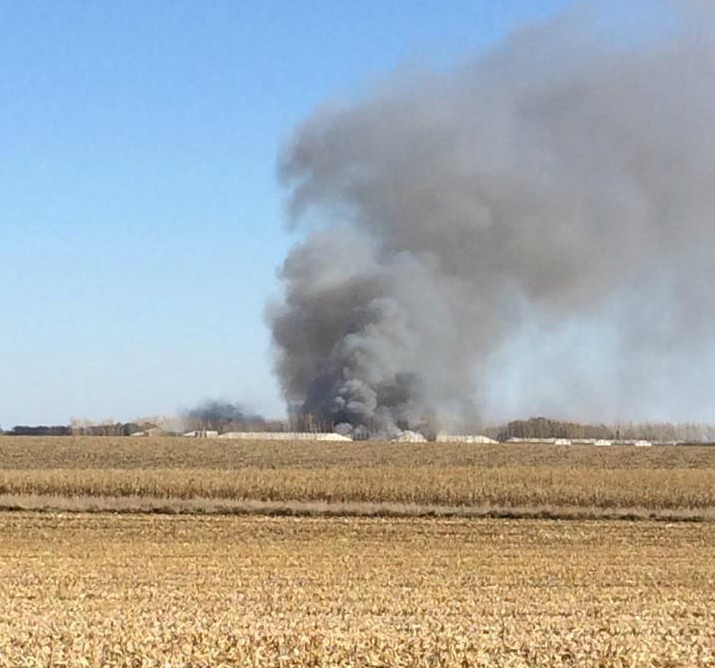 What I didn’t realize at the time was this smoke was a sow farm burning. Cougar Run is a sow farm (sows and piglets) located about 20 miles northeast from where I live and there were billows of smoke coming from it’s barns. As I have had some time to process this tragedy, I realize there are some other devastating consequences from this fire. I personally do not know much about this farm or the people who own it or work there, but as a fellow pig farmer I am so sorry for what has happened. The death of 4100 sows and about 6000 piglets is almost unbearable to think about. There were four employees working at the time and they were able to escape without injury. Not only is losing the animals horrific, but the barns are gone. 15 people, who left their job on Friday to enjoy a beautiful Minnesota fall weekend, now find their place of employment gone on Monday. And beyond that, pig farmers who are counting on those piglets in the coming weeks and months to put in their barns will no longer have them. What will they do in the interim? They will either outsource their weaned pigs from elsewhere, rent the barns to someone else or let them sit empty until new barns are built. Neither of these choices are perfect. The issue with outsourcing weaned pigs is the market can be very volatile and disease is also an issue. When you have ownership in a sow farm, such as Cougar Run, you purchase weaned pigs at a price close the cost of raising the pig. These prices stay pretty stable and helps to take some risk out of pig farming. When you purchase weaned pigs elsewhere, you are at the mercy of the supply and demand market )which can be brutal at times) and also the possibility of more risk because of pig health concerns. Letting a barn sit empty is not viable as the farmer has costs associated with the barns, such as barn payments, heating the barns and general upkeep. Renting the barns may not be a viable option when trying to find the right person and the right fit. It is some of these other issues we tend to forget about because we are so focused on the immediate devastation. And rightly so. But soon, reality will set in as these other issues will need to be dealt with. Today as we stepped into our barns, we were a little more attentive. Does everything look right? Is there any potential fire hazards? Even though we don’t know the cause of the Cougar Run fire as of yet, one can’t help but be more cautious about your own barns. And you count your blessings just a little more intently. At this point and until we know different, it was an accident. A terrible, terrible accident. I am also a believer in finding a little good coming from something so, so bad. And I hope this case is no exception. So far there is some good. From the feedback I am receiving, people are showing compassion and support for this farm and community. Small town America supports each another, through good and bad. And I couldn’t be more proud. For more coverage, please check out KEYC-TV.